Banner Gateway Medical Center offers the ideal environment for patient and family focused care. It is the next generation of hospital care within a healing environment designed to enhance patient outcomes, patient healing and patient safety. 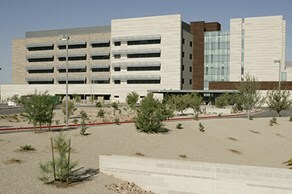 The hospital offers 177 private rooms, nine operating suites and an Emergency department with 37 private treatment rooms. The 60-acre campus has the capacity to triple in size with the addition of two patient towers and coordinating support services. We were also the first in the country to offer an extra type of monitoring, iCare, for our medical/surgical patients as well as intensive-care patients. Also located on our campus is Banner MD Anderson Cancer Center. This center brings the world-renowned resources of The University of Texas MD Anderson Cancer Center to our community. Patients experience customized, comprehensive and compassionate cancer care while having a team of experts who understand the nuances of each type of cancer to develop a treatment plan based on his or her unique needs.